English portrait and landscape painter, the most versatile English painter of the 18th century. 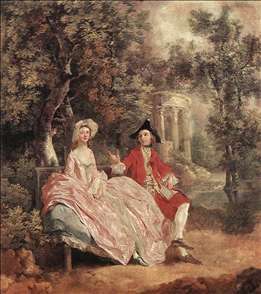 Some of his early portraits show the sitters grouped in a landscape ( Mr. and Mrs. Andrews, c. 1750). As he became famous and his sitters fashionable, he adopted a more formal manner that owed something to Anthony Van Dyck (The Blue Boy, c. 1770). His landscapes are of idyllic scenes. During his last years he also painted seascapes and idealized full-size pictures of rustics and country children. Gainsborough declared that his first love was landscape and began to learn the language of this art from the Dutch 17th-century landscapists, who by 1740 were becoming popular with English collectors; his first landscapes were influenced by Jan Wynants. The earliest dated picture with a landscape background is a study of a bull terrier--Bumper--A Bull Terrier (1745; Sir Edward Bacon Collection, Raveningham, Norfolk), in which many of the details are taken straight from Wynants. 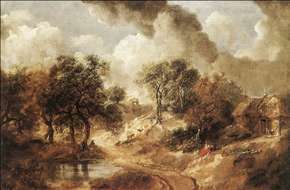 But by 1748, when he painted Cornard Wood, Jacob van Ruisdael had become the predominant influence; although it is full of naturalistic detail, Gainsborough probably never painted directly from nature. The Charterhouse, one of his few topographical views, dates from the same year as Cornard Wood and in the subtle effect of light on various surfaces proclaims Dutch influence. In the background to Mr. and Mrs. Andrews, he anticipates the realism of the great English landscapist of the next century, John Constable, but for the most part fancy held sway. In many of the early landscapes the influence of Rococo design learned from Gravelot is evident, together with a feeling for the French pastoral tradition. The Woodcutter Courting a Milkmaid is an Anglicized version of a French theme, which recalls compositions by Jean-Honor Fragonard. 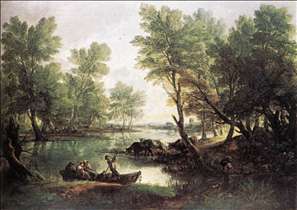 Although Gainsborough preferred landscape, he knew he must paint portraits for economic reasons. The small heads painted in Suffolk, although sometimes rather stiff, are penetrating character studies delicately and freely pencilled, particularly the jaunty self-portrait in a cocked hat at Houghton. 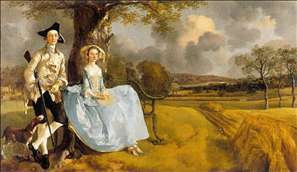 Gainsborough painted few full-length portraits in Suffolk. Mr. William Woollaston, although an ambitious composition, is intimate and informal. The Painter s Daughters Chasing a Butterfly, composed in the last years at Ipswich, is, in its easy naturalism and sympathetic understanding, one of the best English portraits of children. After he moved to Bath, Gainsborough had less time for landscape and worked a good deal from memory, often drawing by candlelight from little model landscapes set up in his studio. 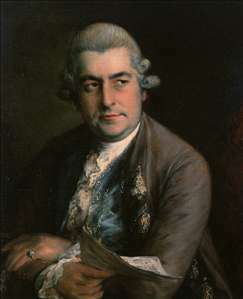 About 1760 Peter Paul Rubens supplanted the Dutch painters as Gainsborough s chief love. This is particularly noticeable in Peasants Returning from Market, with its rich colour and beautiful creamy pastel shades. 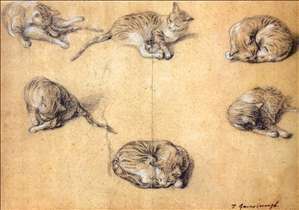 The influence of Rubens is also apparent in The Harvest Wagon in the fluency of the drawing and the scale of the great beech trees so different from the stubby oaks of Suffolk. The idyllic scene is a perfect blend of the real and the ideal. The group in the cart is based on Rubens Descent from the Cross (1611-14) in Antwerp cathedral, which Gainsborough copied. In Bath, Gainsborough had to satisfy a more sophisticated clientele and adopted a more formal and elegant portrait style based largely on a study of Van Dyck at Wilton, where he made a free copy of Van Dyck s painting of the Pembroke family. By 1769, when he painted Isabella Countess of Sefton, it is easy to see the refining influence of Van Dyck in the dignified simplicity of the design and the subtle muted colouring. 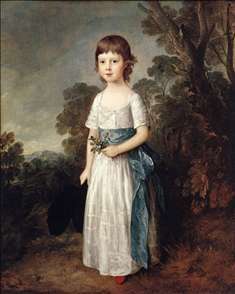 One of Gainsborough s most famous pictures, The Blue Boy, was probably painted in 1770. In painting this subject in Van Dyck dress, he was following an 18th-century fashion in painting, as well as doing homage to his hero. The influence of Van Dyck is most clearly seen in the more official portraits. John, 4th Duke of Argyll in his splendid robes is composed in the grand manner, and Augustus John, Third Earl of Bristol rivals Reynolds portraits of the kind. 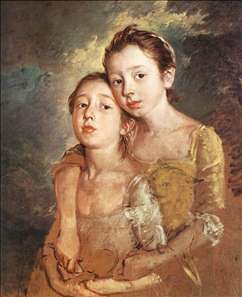 Gainsborough preferred to paint his friends rather than public figures, and a group of portraits of the 1760s - Uvedale Price, Sir William St. Quinton, and Thomas Coward, all oldish men of strong character - illustrate Gainsborough s sense of humour and his individual approach to sympathetic sitters. In some of Gainsborough s later portraits of women, he dispensed with precise finish, and, without sacrificing the likeness, he concentrated on the general effect. Mrs. Sheridan melts into the landscape, while Lady Bate Dudley, a symphony in blue and green, is an insubstantial form, almost an abstract. 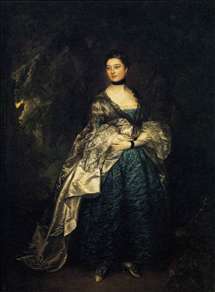 Mrs. Siddons, on the other hand, shows that Gainsborough could still paint a splendid objective study. Few of the later male portraits are of a pronounced character, but exceptions are two particularly good pictures of musicians, Johann Christian Fischer and the unfinished Lord Abingdon (private collection). A new venture in 1783 was The Mall in St. James Park, a park scene described by Horace Walpole as all a flutter like a lady s fan. The Morning Walk, with romanticized figures strolling in a landscape, is painted in the same spirit. 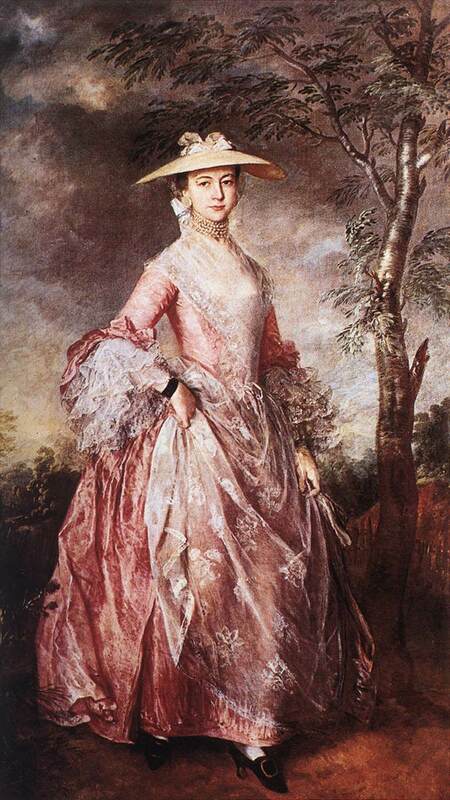 The fancy pictures painted in the 1780s gave Gainsborough particular pleasure. They are full-sized, idealized portraits of country children and peasants painted from models - for example, The Cottage Girl with a Bowl of Milk. The idea appeared in immature form in the little rustic Suffolk figures, and he may have been fired to exploit it further by seeing the 17th-century Spanish painter Bartolom Murillo s St. John, which he copied. See more details about "Conversation in a Park"
See more details about "Mr and Mrs Andrews"
See more details about "Landscape in Suffolk"
See more details about "The Artist's Daughters with a Cat"
See more details about "Lady Alston"
See more details about "Mary, Countess of Howe"
See more details about "Six studies of a cat"
See more details about "Master John Heathcote"
See more details about "Johann Christian Bach"